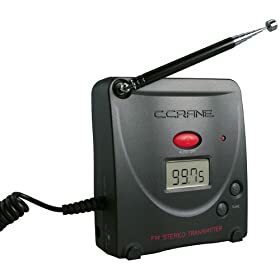 I use a CCrane FM transmitter. I plug the output of my computer into it and send whatever I am playing in iTunes- whether it's my ITunes library or any of the internet radio streams - and listen with any FM receiver in the house (or outside). Best $65 I ever spent. It comes with AC power adapter so no batteries to replace, it stays on 24/7, but can be run on 2 AA cells for portable use if desired. It easily covers about a 150ft. radius. One more thing. With the CCrane Xmitter sending any internet radio stream (or my entire iTunes library) I want to chose to all the FM receivers in my house, I don't feel a need to purchase an internet radio just yet, though it is a strong temptation. I will wait for more features and/or lower prices. I use a transmitter for my internet radio and HD Radio listening, and it has revolutionized my radio entertainment. I can listen to whatever I want anywhere in my house or yard. Being obsessed with having the best I can get, I've spent much more than one will spend on the CCrane, though I do like my setup. Most people should be more be pleased with the CCrane, especially after making the adjustment to the pot. What is your FM (or AM) transmitter setup? Look in my comment in Jeff's post about Brian's Logitech Squeezebox, just undervthis post. I was probably too wordy there in describing my setup. My next addition will be an audio processor. Feel free to ask if you have any questions. I also have the cCrane FM transmitter and after I made the mod, it works great and covers my entire house. I have connected the transmitter to my Squeezebox Boom and it now transmits to all my vintage and shortwave radios in the house. But here's the best part, I have an iPhone and have purchased the iPeng application which allows you to control the Squeezebox from any room in the house. So I can turn any radio on and tune to where I am broadcasting the transmitter and then select whatever stream I want. Perfect. This also will work with the iPod Touch connected to your wireless wifi network. I had the cCrane but promptly returned it. They gave me a hard time about the return but did not tell me about the mod. I suspect it would have worked ok if I had made the mod. I have a Whole House Transmitter (www.wholehousefmtransmitter.com) that works great. I use my FM transmitter to broadcast my WiFi radio throughout my home. I do not live in a crowded FM market. This makes it is easy for me to do. If you live in a market that is crowded with FM signals which negates the use of an FM transmitter then I suggest using the DigiFi Opera S1. It uses a 2.4GHz transmitter and receiver to send lossless audio from the source to the wires earbuds. There are other wireless 2.4GHz models from DigiFi, but having used several I prefer the Opera S1’s. They are built on Kleer’s KLR3012 chipset. Up until a week ago you could purchase them direct from Kleer for $95. There sporadic sites you can purchase them for about <$120. Also, Radio Shack just branded these headsets and is selling them for $130. They are pricey, but for the lossless audio and the ability to transmit in a crowded FM market they are a dream come true. Besides price the other downside is range. There is no after-market way to mod the range on these. You can get 45 feet line of sight and 15 feet with significant obstacles/walls in the way.